Join this 2-day tour departing from Guatemala city early in the morning. On day 1, we are going to visit the lively highland of Guatemala, visiting the colorful market of Chichicastenango. It is well known for its famous market days on Thursdays and Sundays where vendors sell handicrafts, food, flowers, pottery, wooden boxes, condiments, medicinal plants, candles, pom and copal (traditional incense), cal (lime stones for preparing tortillas), grindstones, pigs and chickens, machetes, and other tools. Afternoon transfer to Lake Atitlan (Panajachel) to spend the night. On day 2, we visit Santiago Atitlan Village by boat tour. 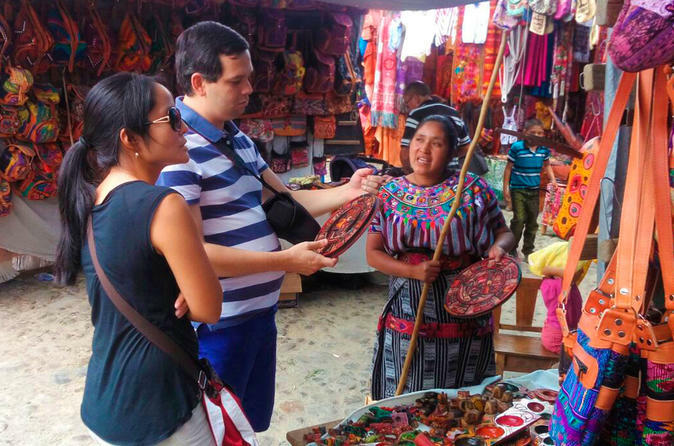 Depart from your hotel in Guatemala City to Chichicastenango at 6:30am (vía Antigua Guatemala) where you will see the most colorful and picturesque outdoor market in Guatemala. Every Thursday and Sunday, locals from the region gather to buy and sell fruits, vegetables, flowers, grains, animals, textiles and handicrafts. Visit the Santo Tomás Church. There will be time for lunch (not included) before continuing to Panajachel on Lake Atitlan, one of most beautiful place on the world. Overnight in Panajachel, Atitlan. This tour does not include accommodations, so please indicate where you will stay. Pickup at your hotel in Panajachel. Take a scenic boat ride across Lake Atitlan to the village of Santiago. Lake Atitlan is renowned as one of the most beautiful lakes in the world. German explorer Alexander von Humboldt is the earliest prominent foreigner to be quoted as calling it "The most beautiful lake in the world," and Aldous Huxley famously wrote of it: "Lake Como, it seems to me, touches on the limit of permissibly picturesque, but Atitlán is Como with additional embellishments of several immense volcanoes. It really is too much of a good thing." Arrive to the village of Santiago Atitlan, the town sits on a bay of Lago Atitlan between two volcanoes. Volcano San Pedro rises to 2,846 metres (9,337 ft) west of town and Volcan Toliman rises to 3,144 metres (10,315 ft) southeast of town. Volcan Atitlan, with a summit of 3,516 metres (11,535 ft), is south-southeast of town. Santiago Atitlan is southwest of Panajachel across the lake. Visit the Mayan God Maximon and learn about the spiritualism and beliefs of the T’zutujil Maya. We will learn about textiles with a woman wrapping her head with the long head-ribbon or cinta that resembles a halo when in place. We will also see women backstrap-loom and embroider their lovely huipiles, as well as the pants worn by men. We will visit the Santiago Apostol Church. It was built between 1572 and 1581, and has been restored and reconstructed several times after significant earthquake damage. It has three altarpieces representing the three volcanoes that tower over the village. We return to Panajachel to take a walk in the Santander street. There will be time for lunch at your own expense. At the end of the tour, transfer to Antigua Guatemala or Guatemala City.